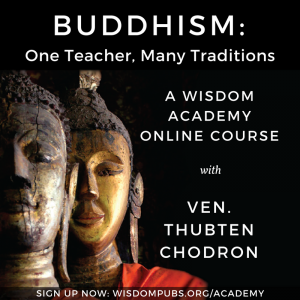 Venerable Thubten Chodron is an author, teacher, and the founder and abbess of Sravasti Abbey, the only Tibetan Buddhist training monastery for Western nuns and monks in the US. She graduated from UCLA, and did graduate work in education at USC. Ordained as a Tibetan Buddhist nun in 1977, she has studied extensively with His Holiness the Dalai Lama, Tsenzhap Serkong Rinpoche, and Kyabje Zopa Rinpoche. Ven. Chodron teaches worldwide and is known for her practical (and humorous!) explanations of how to apply Buddhist teachings in daily life. She is also involved in prison outreach and interfaith dialogue. She has published many books on Buddhist philosophy and meditation, and has co-authored a book with His Holiness the Dalai Lama—Buddhism: One Teacher, Many Traditions. Visit thubtenchodron.org for a media library of her teachings, and sravasti.org to learn more about the Abbey. See Thubten Chodron's teaching schedule here. VIDEO - Ven. Thubten Chodron: Is what we think true?